Amazon is a massively profitable company. Its founder, Jeff Bezos, is the world’s richest man, by far – at least $50 billion richer than every other billionaire on the planet, and light years ahead of you and me. 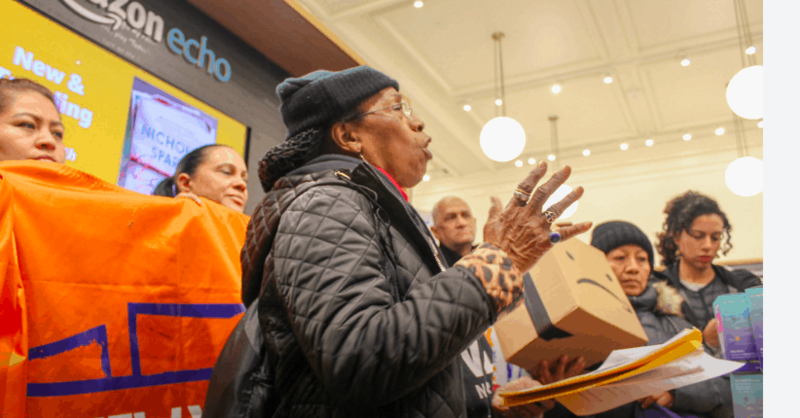 That’s why the $3 billion gift bag Governor Cuomo and Mayor De Blasio just promised to Amazon is a punch in the gut to New Yorkers like Nathylin Flowers Adesegun, who like me is a member of VOCAL-NY, a grassroots group devoted to creating healthy and just communities. We’re the ones who make this city great, even as we find it harder and harder to live here. Here’s why we’re so upset. For years, we’ve been fighting for modest things to improve our daily lives: housing for the homeless and those living with HIV, a transit system that is safe and reliable, and access to quality education for all children. Then Governor Cuomo and Mayor De Blasio turn around open their money spigot for the world’s richest man and his mega-billion dollar corporation – just weeks after New Yorkers came out in record numbers to support them, and gave Democrats control of our State Senate for the first time in decades. We’re the ones who made New York’s Blue Wave a tsunami for Progressive change this year. But what do we get in return? Even after all of this hard work, we just hear the same thing: “Sorry, we just don’t have the money.” Shrug. So we decided to take our message straight to the streets, and to Amazon’s door. 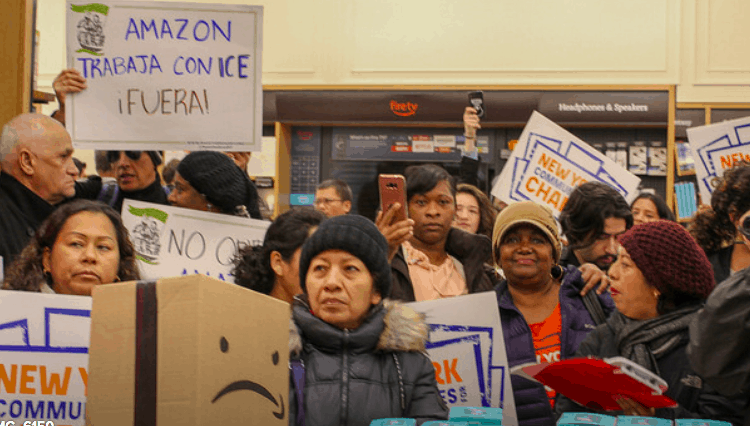 Amazon’s famous “smile” boxes now look like frowns for us, and on Monday we talked about the consequences Amazon’s new headquarters will have for real New Yorkers: rents that double or triple overnight, overtaxed transit, and more residents pushed out of the city and into homelessness. We’re not making this up – we know what’s coming. 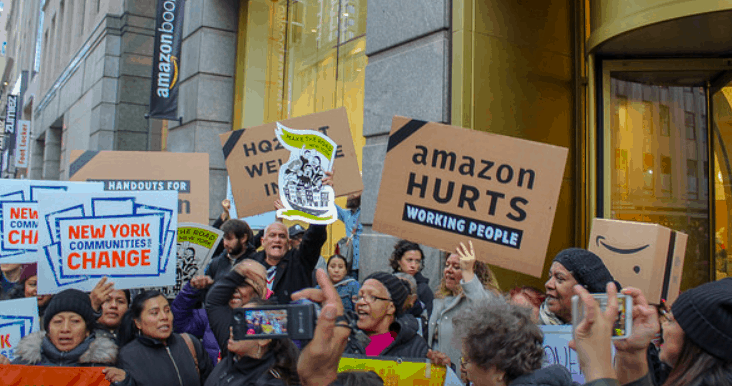 As a part of People’s Action, we know from our sister organization in Seattle, WashCAN, how Amazon’s business practices have pushed people into the streets. And we also know that if there’s any chance to protect the lives and homes of residents, it’s before Amazon sets up shop – not after. I care about this so much because like Ms. Flowers, I’ve been homeless myself. And as a person living with HIV, I understand on a personal level how homelessness is traumatic, but also has health implications for people who may be dealing with chronic illnesses. I understand how housing can be the key for health and well-being for all people. As the HIV/AIDS campaign coordinator for VOCAL, I see how HIV and its complications grow in communities where there is no investment. We’ve urged Governor Cuomo to end the HIV epidemic in our state, and he’s pledged to do so – by increasing rental assistance and access to care. But talk is cheap, and the dollars don’t follow. So in New York, I’ve watched this epidemic grow in low-income communities. HIV is a social justice issue with public health implications – and poverty is the number one driver of this epidemic. I’m invested in this because I see how the intersections of poverty and public health impact communities of color, and also I’ve experienced that personally. Now it’s time for our elected leaders to step up and invest, too. Imagine what even a fraction of Amazon’s $3 billion could do for New York’s low-income and homeless residents, and those living with HIV. 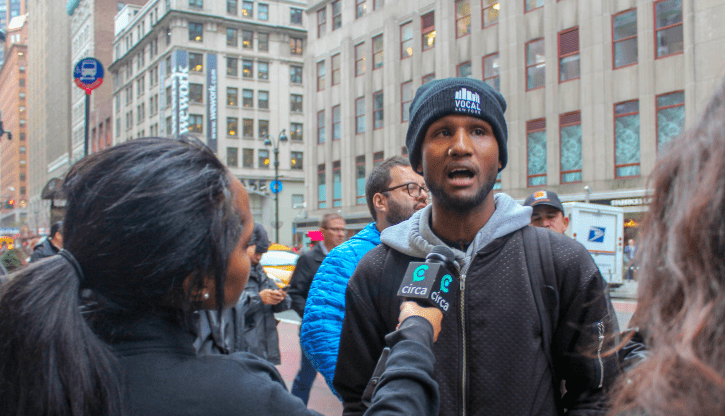 We demand homes for every New Yorker, and that a significant portion of this money go to help those who need it most, not those who need it least, like Amazon and Bezos. So Governor Cuomo and Mayor De Blasio, it’s time to step up and put your money where your mouth is, for real New Yorkers like Ms. Flowers and me.